"He's like the Elvis Presley of the industry right now," said one U.S. banker who knows Marchionne well. 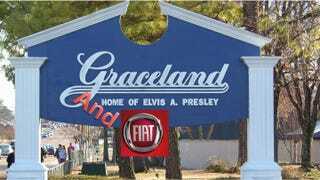 "Not only because Fiat had been doing better and he's getting a lot of accolades for turning Fiat around. But it looks like he cut himself a great deal on Chrysler so he's looking like the smart guy in the room right now." This is how Sergio Marchionne, CEO of Chrysler, Fiat, was described in a Reuters report back in 2011. Well now, it looks like he's taking the whole Elvis thing further than ever imagined. The Detroit News is reporting Marchionne is planning on moving Chrysler and Fiat's joint headquarters to the Volunteer State (not necessarily Memphis). Will it happen? Who knows. Now the jockeying will begin in earnest. Michigan will begin to fight for keeping Chrysler and perhaps the UAW will see it as a harbinger of things to come. Could Chrysler start building non-union plants in Tennessee? In the meantime the Detroit News reports "Marchionne met with Tennessee Gov. Bill Haslam and others on Sunday at a ceremony to mark the expansion of Fiat subsidiary Magneti Marelli’s components plant in Pulaski."